Looking for a invoice template that'll work for a painting job? We've got you covered and it's free! Do I need more than just a job painting invoice template? If you're looking for a free job painting invoice template, you've had a stroke of luck because you're in the right place. But ZipBooks doesn't just hand you a basic template and send you on your way. We let you bill as many customers as many times as you want, and we have a time tracker that links directly to the invoice. So, you can tap it when you begin your project, paint, and then tap it at the end and it automatically enters the info into an invoice template. Stick around to see what more we can offer you. What should I include on my painting job invoice template? A great feature that ZipBooks is that you can rest easy knowing that we will help you every step along the way sending of your first invoice. We help you to know what to include in your invoice based on real-time feedback that we provide in the form of a invoice quality score. Using ZipBooks for your painting job invoice means never forgetting to include critical information. 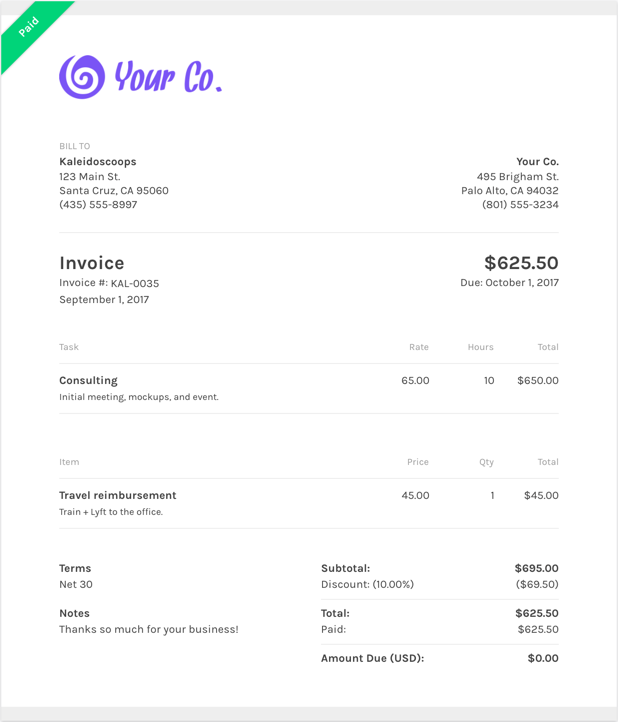 We actually score your invoice based on what information you include and so you’ll be able to leverage the data we’ve collected from tens of thousands of invoices on what things are important to get you paid faster. WWhy should I use ZipBooks’ job painting invoice template to create and send my job painting invoice?